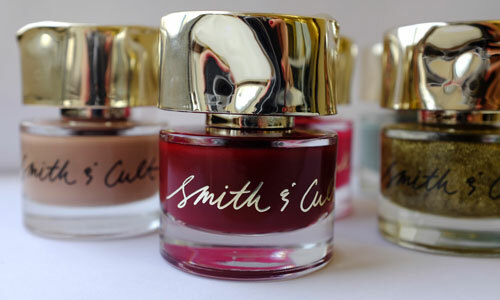 ATTN Beauty Junkies: Meet Smith & Cult. This line is the beauty child of Dineh, the creative genius behind Hard Candy, who can’t be tamed. Since you are definitely gawking at the cap, quick story - to create these, Dineh took a bunch of metal caps and a hammer and went wild. After denting - she narrowed it down to her favorite tops, and recreated them for this packaging. Every dent had to be, the perfect dent. And they are, perfect. Smith & Cult is based around the “Diary of a Beauty Junky”. Each color and name (Feathers & Fringe, Bitter Buddhist) represents a time in a beauty junkies life, from tame to not so tame. We can relate.